Computer Science and IT degrees focus on developing theoretical foundation for information and computer systems. Students that opt for this program can further on pursue broader areas of specialisations in this field. New Zealand's excellence in innovation enables candidates to develop a range of skills and further adds value to their undergraduate years. Another popular program, this course provides excellent grounding in the basics of psychology, and covers the developmental stages in this domain. New Zealand establishments additionally encourage their students to intern or volunteer in their free time. This international exposure allows candidates a chance to gain professional knowledge and expertise in this area. The agriculture and forestry degrees in New Zealand are currently emerging as a vital field of science and technology. Students that wish to pursue a program in this field require a strong grasp over natural sciences and social sciences. This course program enables candidates to develop a wide range of technical skills and knowledge, while subsequently helping them understand the key factors in the agricultural industry. New Zealand is home to some of the most reputable public universities across the globe. Known for its booming film industry, institutes here offer top rank animation programs. Those keen on entering the media world should look to New Zealand as their study abroad destination. This course curriculum is designed to meet the changing trends in management, and offers students the opportunity to gain a broader perspective into the business world. Students are encouraged to not only develop ideas with sound reasoning, but also apply their classroom knowledge to real life instances. This helps students in achieving their long term business goals. One can expect an enriching and successful career when living and studying in New Zealand. "Edwise has helped in all nooks & corner & because of which thinking about dreams coming true can be made possible. Thanks to the visa officer and the counselor for their dedicated support and commitment." "It has been a remarkable learning experience where I have been able to grasp the points of dealing with International Admission. My expectations were not only met, but exceeded when it came down to the crunch issues of admissions and visa approval. The staffs at Edwise are a warm, caring and a thoroughly professional lot. My experience can be summed up in one word." "Edwise made it possible for me to study in NZ.I cannot thank you enough for guiding me throughout the journey. All the application and fee transfer was done so efficiently that I didn't have to worry about anything. The counselors are friendly and go out of their way to help. I've been suggesting Edwise to all my friends who plan to study abroad. Wish you all the success in your endeavours." "My Experience through Edwise was Great! Team was very Supportive and Cooperative throughout my entire process of Application. Counselors are certainly good, well trained. They help me to choose a right college and courses suitable for me." "It's very nice working with Edwise international all the staff members are very encouraging and helpful Thanks a lot." 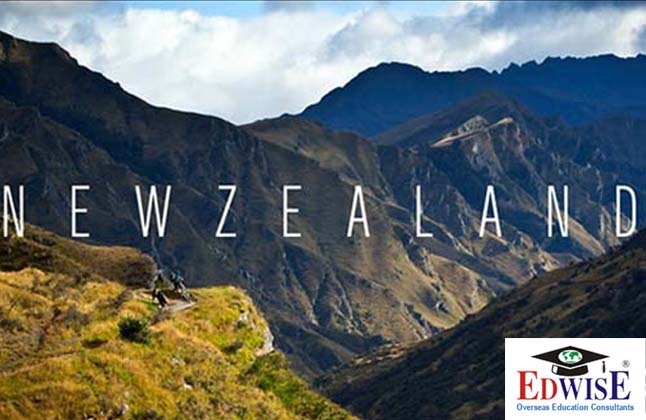 For complete information of Study in New Zealand, Contact Edwise International Overseas Education Consultants, on 1-800-200-3678 (Toll Free) / 08600911333.